Winter box schedule - please mark your calendars! Posted 11/6/2018 2:41pm by Tim Livingstone. This is the first pick up week for your winter boxes. Please refer to the chart below and set or mark your calendars for these pick up weeks. We send out email reminders as much as possible, but there can be issues with everyone getting the reminders on time, spam filters, etc. 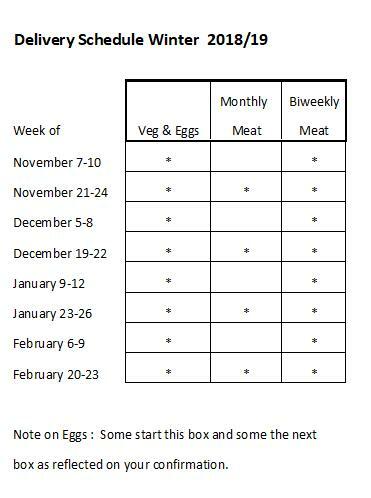 so please also keep track on your own calendars so that you don't miss out on any of your great winter produce! We look forward to seeing many of you later this week.